Where we live, the temperatures this week are definitely starting to feel like spring! And with the changes in weather come the changes in clothing needs. I often dread this because in my house, it typically means that we have a several weeks where it seems like our closets have exploded! I’m trying to get ahead of things this year, though, and I’m starting with this handy dandy wardrobe inventory that we adapted from our Organize Your Closet online class. I’ll print one out for each family member so I can see what everyone has and still needs for spring. Then, when I’m headed out to the stores, I can take these along to make sure I’m buying things we need instead of things we already have. For example, on my daughter Faith’s sheet, I am putting “capri pants, 6 slim” in the first column. Under the “Has” column, I wrote khaki, denim, pink floral. And under “Needs,” I listed white. As I do this, I’m making sure that she has shirts in the right size to go with these pants. So the next item I listed is short sleeve-tops, size 6, and then obviously what we have and what I’d like to find while shopping. I’m pretty excited about this because I think it’s really going to help me avoid having too many similar items and not enough things to match them! 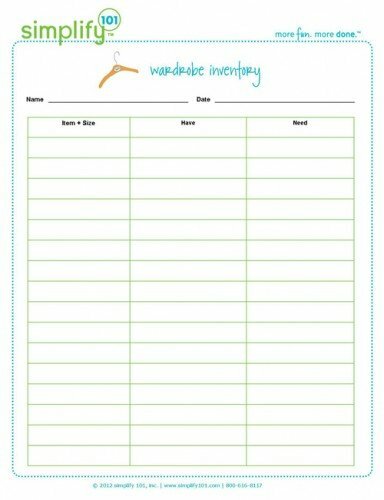 Go ahead and grab this free wardrobe inventory printable for yourself. I’m keeping my inventories on a clipboard that I can carry with me from closet to closet, as well as to the stores. This will be great for me, but the truth is that I need more help than one single printable can provide. Can you identify? Then be sure to grab your spot in the Organize Your Closet self-paced online class. For less than the cost of a new pair of shoes, you get the expertise of a professional organizer to guide you through the process of transforming your closet into an organized, functional space. I seriously cannot wait to start! Thank you for this!!! My youngest girls are 8, 6, 5, and 4. The older they get the more clear they have vastly different body types. So even the clothes they pass down to each oter only fit certain sisters. So not only do I have to keep track of which style of the same size jeans fit which girl, I then have to attempt to fill in holes. Never ever does the parts of multi piece outfit get passed to the same sister, so it can be difficult to find just te right thing to make a piece wearable. In the past year seasonal clothing and sizing updates have become my most dreaded chose. I WILL be making use of these sheets! Hey, Love this list… I have three kids and it gets harder and harder to stay organized. Especially while their in school and with the economy the way it is… it’s like you really have to separate the needs from the wants. This is definitely a good way to stay organized. I already printed out three, and am starting organizing tomorrow. Love this… thank you! It will come in very handy as I try to work out the holes in the closet! Thanks, I am so glad you like it! @Caryn, I completely hear you on the ages/sizes complications! @Jodie, did you get a good start this week? @Carin, I agree… finally a solution to those wardrobe holes. I was lOoking for the 10 printable organizing lists?